How about a farm animal vector art set? I put this vector set together from 2 freebie posts at HG Designs. Heather has some great digital resources for designers and scrapbookers. Check out her other vector freebies. This farm animal vector set includes a horse, bull cow, sheep, pig, and a rooster in AI, EPS and SVG formats. Also included is the PSD file of the textured promotional image above. 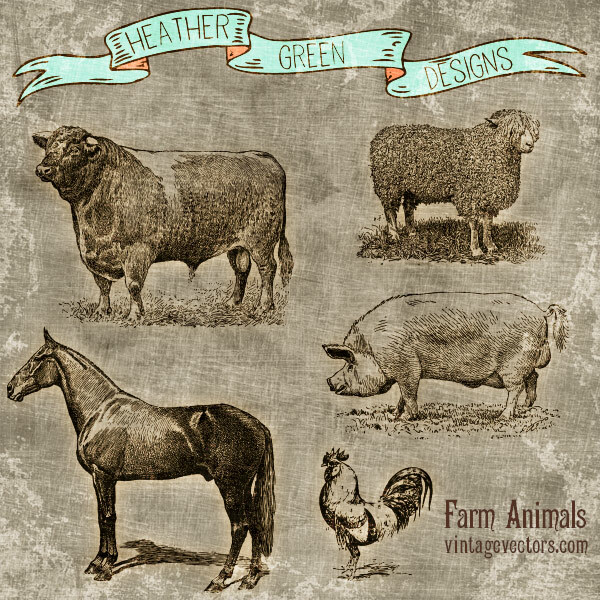 These vectors can make for a great vintage country design or craft project. Who doesn’t like farm animals? and free vector art?